Find a place to stay and all the best things to do. Check out our Real Estate page – click the link on the menu bar at the top of every page. 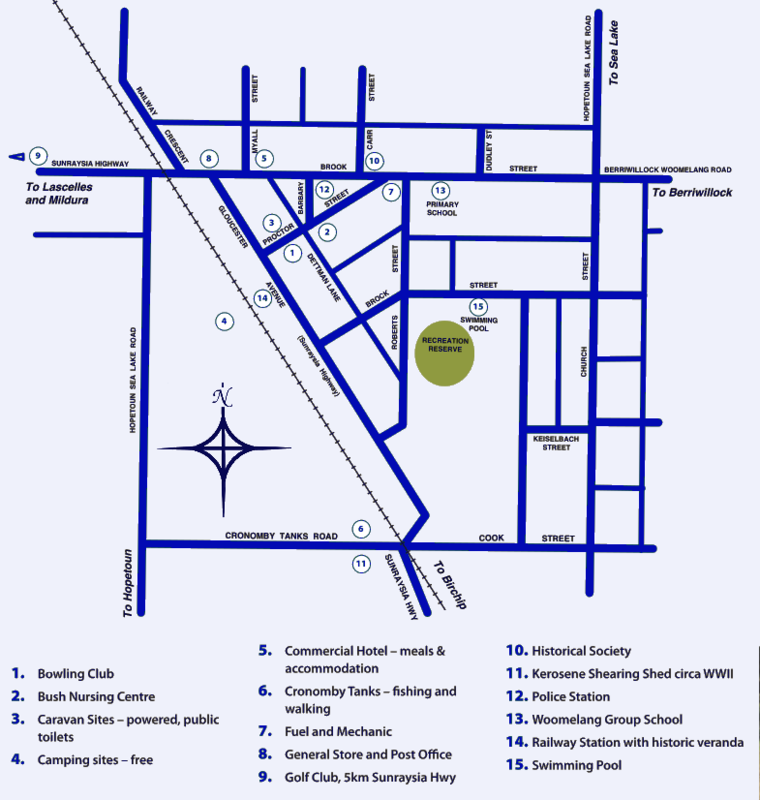 Lions Caravan Park – FREE camping in town with shower and toilet block and 2 powered caravan sites, on the corner of Gloucester Ave (Sunraysia Highway) and Proctor Street – see the map. 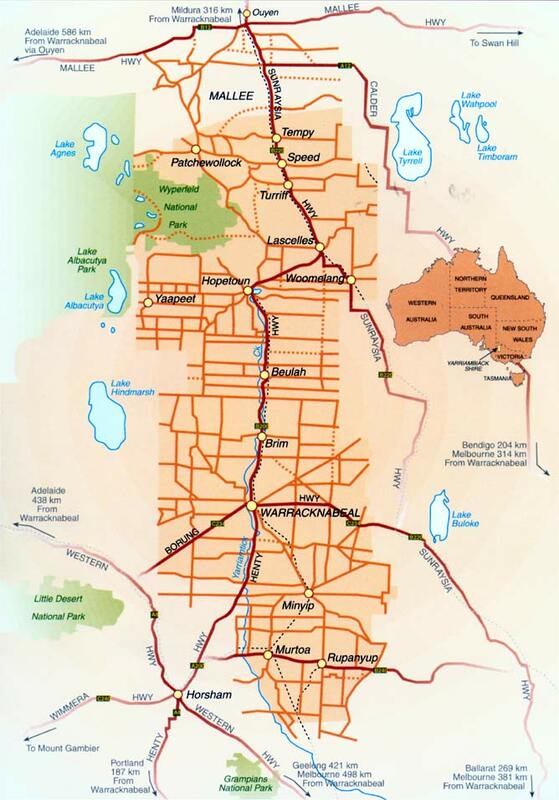 Cronomby Tanks – FREE camping at the Cronomby Tanks Recreation Precinct, enter from CronombyTanks Road – see map. Stay in a local home – close to everything and there’s even a pool! Click here for more details. Minapre Hotel, Lascelles – see below for the link. Where’s the RV Dump Point? It’s in the Combine Corner complex – enter from Myall Street behind the Multi-Purpose Centre, drive straight ahead and it’s on your left. https://goo.gl/maps/yXnfZPM1cST2 will give you a map for directions. Woomelang General Store and Café – take-away or eat in during opening hours; sit-down home-cooked meals Friday evenings from 6pm. The Woomelang Hotel – lunches from Wednesday through Sunday, dinner Thursday through Sunday. Minapre Hotel, Lascelles – Pizza available seven days a week; home-cooked tucker most nights. – FREE camping, fishing, walking and general recreation! -Wartime shortages at their best, a shed made of kero tins. – The only place to be on a hot summers day – pack a bbq tea and enjoy the free facilities. $3 pp entry. – Late February/early March – see the Bulldog tractors in all their glory! Click here for the 2013 pics. – Hosted by the local CWA and school Parent’s and Friends on the 3rd Thursday in October, a fine example of the local talent. We’re right in the middle of the Yarriambiack Silo Art Trail, which stretches from Rupanyup to Patchewollock. Here’s a map of all of the Silo Art in Australia. Jump on to the Shire map to see where we are in relation to other places – or scroll down a little bit to look at the town map. 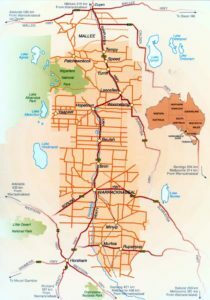 Thanks to the Shire of Yarriambiack for allowing us to use their map of Woomelang – use it to get an idea of where things are. Nearly everything is within walking distance – and it’s a terrific way to keep fit! Click on the small map to see it at full size, and see where we are in relation to everywhere else.